Ex-House GOP hopeful Dan Bongino who was recently beaten to a pulp in his quest to become a member of Congress, took a moment out of his precious schedule to blast the media after a reporter insulted him and got in hot water with his bosses. He also provided commentary on something he knows nothing about: the life of Washington Post‘s mustachioed reporter Dave Weigel. “These people have little-to-no credible life experience other than writing scathing criticisms of others, and yet, their opinions are supposedly to matter,” Bongino wrote awkwardly in a Facebook post. 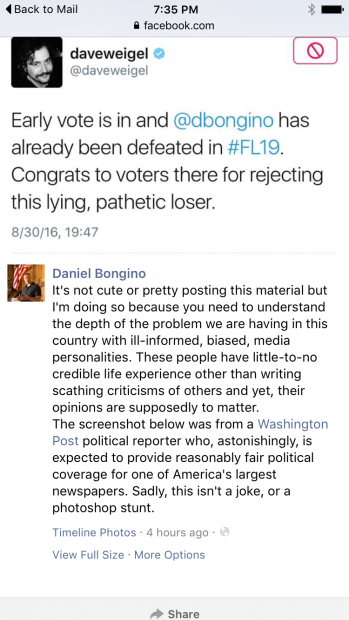 This came after Bongino lost his race and Weigel called Bongino a “lying, pathetic loser” on Twitter. How does Bongino know that Weigel has no credible life experience? Since when are reporters judged by the same standards as an aspiring elected official? The Mirror finds itself in a conflicted position of defending Weigel, who resigned from WaPo in 2010 after I reported that Weigel told his lefty Journolist buddies that he wished media exec Matt Drudge would set himself on fire. But here it is: He was perfectly within his right to express his opinion about Bongino. His bosses at WaPo should’ve backed him. Especially after a would-be member of Congress threatened him with his ridiculous bare knuckles and made vague promises of revenge. “They don’t understand how sharp my knuckles are,” Bongino said of reporters covering him on a recent podcast. Was the candidate saying he was going to give us a knuckle sandwich? Or something worse? Compared to the sneaky nature of Journolist, at least here was Weigel expressing himself publicly with his own name. After Weigel resigned from WaPo, he went to work for then-WaPo owned Slate, Bloomberg and ultimately returned to WaPo in 2015. Over the long weekend, Bongino, in his Facebook post, took special glee in disemboweling Weigel, who got into trouble with his superiors for his tweet. A deputy managing editor even issued issued an irritating memo about it, saying reporters need to be careful on social media and that “even in your private life” you are representatives of The Washington Post. Bongino bombed out in his primary race, winding up in last place among three hopefuls that included former U.S. Ambassador to the Holy See Francis Rooney — the winner — and Chauncey Goss, the son of former Rep. Porter Goss (R-Fla.). Bongino lost by more than 31,000 votes. Weigel wasn’t the only reporter on the receiving end of Bongino’s absurd threats. In the podcast, I was the subject of his lunacy as was Politico‘s Marc Caputo, who engaged Bongino in what may be the most spectacular phone interview of the campaign season in which Bongino completely lost it and dropped about a thousand f-bombs. Bongino later said he went off on Caputo because his wife has lupus. Who wouldn’t have wanted THAT GUY in Congress?